It's been a busy week...I had my doula training on Friday and Saturday and it was great. It really deserves its own post but I'm still processing it all, so you'll have to wait. 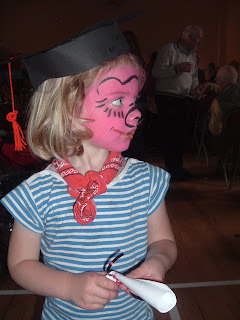 Siofra graduated from playschool, and also played the Pig in the Little Red Hen on Friday. She loved her diploma, but probably loved the pink face paint more. Paddy can say about 10 words now, including "Ra-Ra" for Siofra and he has fully moved into her bedroom now, at least for most of the night. My brother Dan has gone vegetarian and I'm so happy for him! I made this for dinner tonight and it was dee-licious!! You should totally make it for dinner tonight, Dan. 1. Heat the oil in a large pot on medium heat and add the onion and pepper. Cook until softened, about 3 minutes. 2. Add the chickpeas, the curry powder and about a 1/4 cup water. Stir, cover and reduce heat. Cook for about 5 minutes. 3. Add the tomatoes, spinach and a bit of salt. Cover and cook for about 10 minutes, stirring occasionally. Check for seasoning, add salt if needed. We had this over brown rice. This recipe made enough for two adults and two kids with a lunch-sized portion leftover. Honest to goodness, that's it. It's quick, very easy and is so good. Our kids loved it, too. Get cooking, Dan! 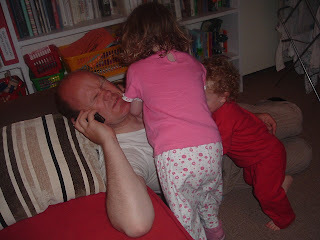 disappointing election results, transatlantic flights, chicken pox times two, an embarrassing run in with some poisonous margaritas and some killer jet lag in my children. My niece's amazing wedding, a whole day of fun and frolic, good food, vodka and grapefruit juice, run ins with the cops (sorry, Dr. Bri! 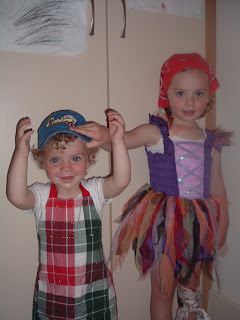 ), painfully cool high heels and Siofra and Paddy dancing their hearts out on the dancefloor. Daithi has exclaimed that it was the best wedding he's ever attended. Well done, Bri and family-what a day to remember. Running into the ever-so-talented (does that sound too sarcastic, am I being mean?) Nelson twins at the bar in Flushing, and then AGAIN on our flight from Flint to Chicago. I mean, really, what are the chances of that? I just can't live without their love and affection. Siofra and Paddy playing outside all day, and constantly having dirty feet from all the fun. Dirty feet are always a sign of a good time. Daithi and I having a peaceful dinner out at the lovely Sorento's while my parents babysat. What a treat. From cool Dublin rain to warm Michigan nights and back again, it's been a busy, fun and memorable couple of weeks. I'm still recovering from it all.